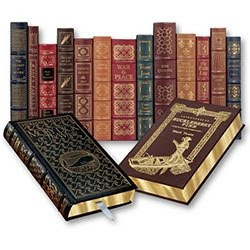 Years ago, when I was single (and had more spare time and money), I subscribed to various editions of leather bound 'heirloom' books from Easton Press. Altogether I bought approximately 200 books, which cost around A$100 each. Since buying our current home seven years ago I've intended to convert our lounge room into a 'library' by building some book cases into one half of the room, but haven't got around to it yet. The books are currently scattered around the lounge room in various locations. Last week I did manage to get one step closer to starting work on this project by buying six flat packs of DIY 'six cube bookcase' kits from Aldi for A$100 each. Beautiful Books, but I think you spent an awful lot for them. Here in the USA I have been finding them at the local auction houses for about 200 to 250 US dollars for about 15 to 20 books. The most I have seen boxes of these same books go for at auction was 325 US dollars for about 15 books. I like your book case idea. Hope you will post pics when its complete. Would love to have a library in my house one day! I like your setup! They cost US$70 or so each when new, and instantly depreciated more than 50% (if I had tried to resell them 'used' just after buying them). However, on the upside they are in perfect condition, and I only bought the volumes that appealed to me. If I have some spare room in my bookcases I may even look around for some second hand leather books at auction - I did once buy a set (28 volumes) of brand new leather bound Funk & Wagnall's encyclopaedias for around $120 when they were on clearance sale. Nice books. I still have about 100K baseball cards in a closet. They increased in value nicely in the 80s but actually now have lost value. Kids today don't care about Hank Aaron and Willie Mays. Its ashame. Reading this makes me want to build some sort of display too - thanks.